Aston Martin DBZ Centenary Collection has gone into production with the first half of its £6million pigeon-pair project. To celebrate the 60-year partnership with Zagato, Aston Martin is building a DBZ Centenary Collection pair in the form of a track-only version of the classic DB4 GT Zagato and a new, road-legal DBS GT Zagato. Aston has released images detailing the construction process for the first half of the collection. 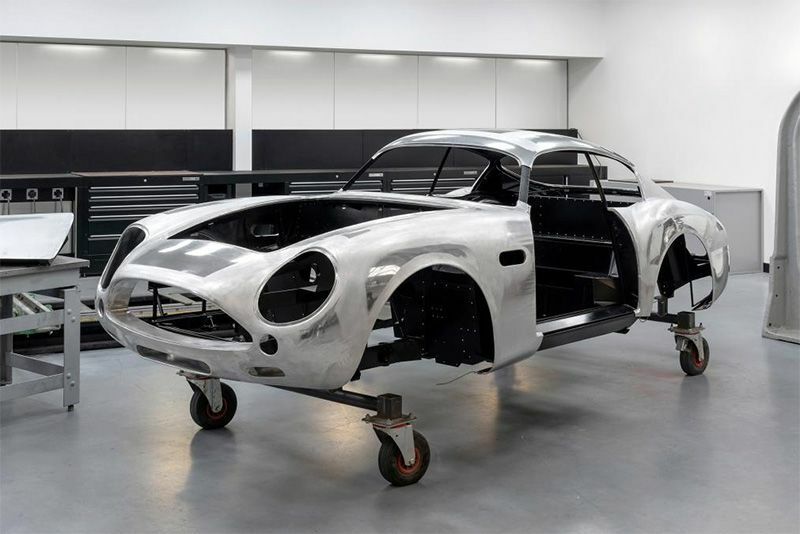 The pictures reveal the DB4 GT Zagato Continuation using a tubular chassis and thin-gauge, aluminium panelling, with hand-crafted body panels specced to a digital scan of an original DB4 GT Zagato. Its insides, though, is where modern-day technology brings this classic design into the future. It was just last year that Aston announced its new Continuation model that promised to follow the design of the original DB4 GT Zagato, injected with a few modern engineering and performance enhancements. It's the sixties meets the 21st Century and its awfully exciting. What this translates to, according to the British manufacturer, is a power figure of 380bhp in a car that your grandfather would have thought was the bees-knees. The powerplant is likely to be a reworked version of the DB4 GT Continuation's 4.2-litre twin-spark straight-six petrol engine with power travelling to the rear wheels via a four-speed manual transmission. If a more mature, road version tickles you pink, then the new DBS GT Zagato will be the twin you gravitate to most. It is to be based on the new Aston Martin DBS Superleggera but there'll be a redesigned body with a carbon-fibre double-bubble roof that accommodates a wide, wrap-around windscreen. There will also be flared wheel arches, unique headlamps and a new grille to set it apart. Although we've heard nothing regarding performance specifications for the DBS GT Zagato, it's reasonable to expect a reworked version of the standard DBS Superleggera's 715bhp 5.2-litre twin-turbocharged V12 will find a home under its bonnet. If you've got £6million to drop then get in touch with Aston, the siblings will be sold exclusively as pairs and only 19 of the sets will be made. Deliveries for the DB4 GT Zagato Continuation will be later this year while the DBS GT Zagato will be ready before 2020 ends.